An MRI scan is the most important test for diagnosing and monitoring multiple sclerosis (MS). It's not a painful experience, but it can be a little strange—and that can be stressful. Knowing what to expect will help make it easier to relax. You will need to complete a questionnaire asking about any metal you might have in your body, such as screws, cochlear implants, and artificial joints. You may be allowed to leave your clothes on if there are no metal zippers, snaps, or buttons on them. Or you may need to change into a hospital gown. You may have an IV inserted into a vein through which a contrast material called gadolinium will be administered later. 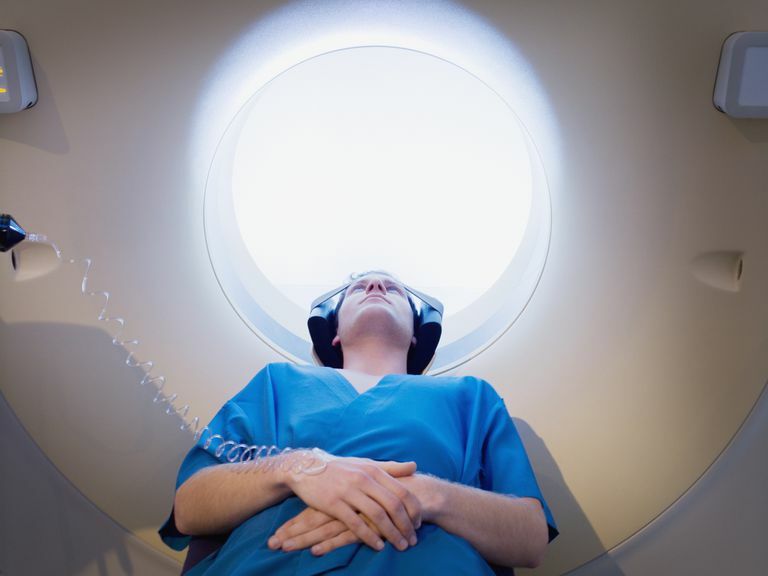 You may get a sedative if you're claustrophobic or very frightened about the MRI. This will need to be prescribed for you before you go in for the procedure, so be sure to ask your neurologist beforehand. You may be given earplugs. You'll lie on the MRI table, a narrow pallet that slides out from the machine. You may be allowed to bring a loved one or friend into the room with you. If you're cold, ask for a blanket. The technician may ask if you'd like to listen to music during the scan. Don't hesitate to say yes, as music can help to drown out the noise of the MRI, which can be loud, and also help you relax. If the MRI will be of your brain, your head will be positioned with cushioned pads to help keep it still, and a “surface coil,” which resembles a plastic cage, will be fitted around your head. The scan will consist of a series of sequences, each lasting between 20 seconds and three minutes. The technician will tell you how long each sequence will last before it starts. The machine will make a loud banging or clanging sound for the duration of each sequence. You may feel some vibration. Between each sequence, there will be a short break of five to 10 seconds. If gadolinium is being used, it will be injected into the IV a little over halfway through the MRI. It may feel cold or sting a bit, but just for a moment. How long the MRI lasts will depend on what is being scanned—the brain, the whole spine, parts of the spine, or everything and whether or not gadolinium is used. Depending on these factors, the test could be as short as 15 minutes or as long as 2 hours. If you were sedated, you will need someone to drive you home. If you weren't sedated, you'll be able to move on with the rest of your day as normal. Ask for a copy of the images. This may come in handy if your doctor needs to compare MRI findings or if you ever seek a second opinion.